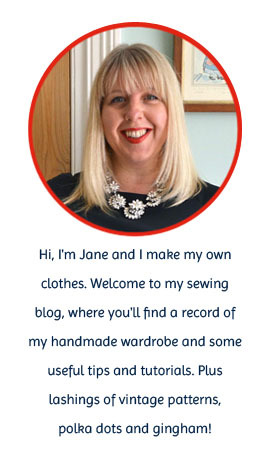 If you like variety and change in your sewing blogs, then this post will probably have you banging your head against a wall. If you like predictability and things on repeat, then you've come to the right place. Yes, I've made yet another version of my go-to pattern for summer - vintage Simplicity 4238. This version is plain white, which some may call boring, but I like to call perfect. Let me tell you, this top is so perfect I'm quite tempted to make another one exactly the same, just so I can rotate them in the wash! It's almost like a blouse version of a white T shirt, but with the lovely added fifties details that drew me to the pattern in the first place. Construction-wise it was a cinch to sew - this is my fourth version (previous versions here, here and here), so I was able to whip through the instructions in no time. The white fabric is cotton pique (Classic Textiles, Goldhawk Road) which has a very slight stretch and a crisp, waffle texture that I really like. It's a bit of a pain to launder, but worth it I think. It makes me think of tennis lessons and sailing - both imaginary of course, I've only had one tennis lesson in my life and I certainly wasn't wearing a crisp waffley white outfit…. The armholes are finished with white bias binding and I added some blue glass boat buttons that have been in my stash for ages. Sadly, the buttons must have been hand painted as they tragically lost their nautical mojo after one wash and you can barely see the boat details now. Never mind, I still like the navy contrast against the white. 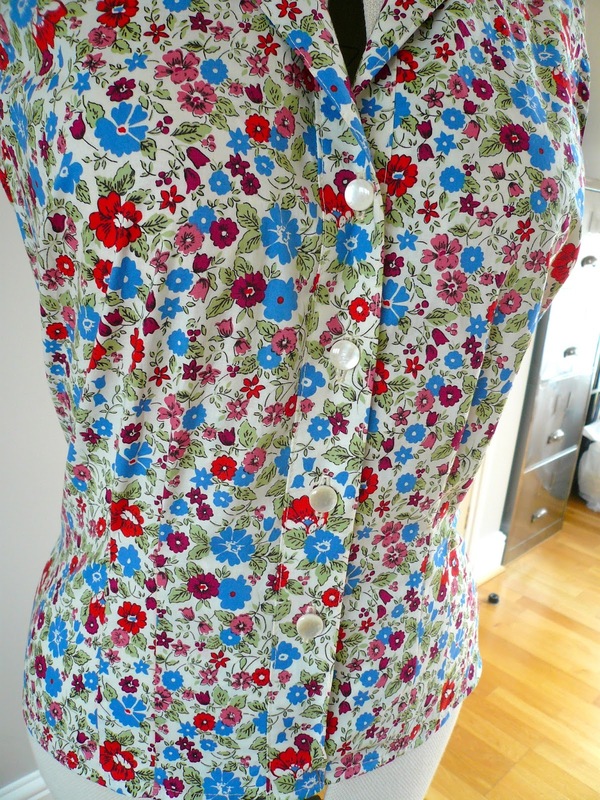 Making this blouse has also made a little notch in my Vintage Pattern Sewing Pledge, hoorah. I'm now two vintage patterns down, one to go. If you have your heart set on a sleeveless fifties blouse, then there seem to be lots of copies of this particular pattern on Etsy. Or this one looks pretty similar too. This got me thinking - I have four versions of the same blouse, maybe I could rotate them day by day and wear variations of the same pattern for a whole week? Sound familiar?! Well, watch this space as I'm working out the finer details of a familiar challenge - all will be revealed in the next few weeks!! In other news, the winner of the Love Sewing magazine giveaway is..... Lucy Howells! Please email me your address Lucy and I'll get the magazine posted to you in the next few days. Thank you to everybody else who entered the giveaway. it's really lovely. of course you have made lots of versions since it suits you so well! do i feel OWOP coming on? I think the plain white is perfect! What a great piece for your wardrobe! I'm a huge repeat fan (just look at my recent MMM post -yawn!). I say if you find and perfect something you love then take advantage of it! Your shirt is lovely! Personally I love seeing - and making - the same patterns over and over, for the reasons people have already said above. And I love wardrobe basics like this! Love all of them! The fit is very flattering. Great job! Would you mind telling me how tall you are? I am playing with proportions. Hmmm....It's clear I need to sew myself a pretty white blouse! Yours has got me all aflutter. Yes, it's simple, but the small details with the darts and the crisp front placket, the fabrication, the buttons...all adds up to adorable, and super wearable! Thanks for going to round four with this pattern. I'm a new follower and I might never have seen this beauty otherwise. Cool to know you're 5'2" too. I'm just under the mark myself! I love this! It's so crisp and gorgeous! In another life I think I was a tennis pro... or at least, maybe I got to wear the outfits! Love that classic white look for summer! Ooh this will get a lot of wear. I don't have a white blouse in my wardrobe but when I did, I wore it all the time. You could try colouring the anchors in permanent gold marker. Try it on a spare to test first. I just about want everything in your wardrobe and this blouse is no exception. It's just perfect. Couldn't resist Jane. Just bought this pattern on Etsy. It's my first vintage pattern and I bought a 14. If the measurements are right I will need to make bigger as I'm a fairly standard 12. Hope I can do it right. Really lovely...just what I've been looking for! There is something undeniably chic & stylish about classic designs like this & you wear it perfectly Jane! To me, it's an "I-have-nothing-to-prove" blouse. Beautiful! Absolutely adore this top, Jane, and all your previous versions of this pattern. Hope you don't mind but I've mentioned it (you) on my blog. Best wishes. Only four versions? I imagine you'll soon have a whole week's worth of this blouse, and maybe even two weeks! I love this blouse because it looks different with each color and print. You look absolutely darling in your latest version. You might try adding an eyelet version! I enjoy seeing your creations, and learning the story behind each new garment. I don't think there's anything wrong with repeating what you've made- it's a sign that the pattern has been a success the first time round if I repeat it. This makes me feel better about using the same pattern over and over! I have been challenging myself to try new ones, because after all that's how we find new favorites, but I have my go-to patterns too. Love how you're using this one. And just think how many fabrics would look good in this design! Go for it!! I never seem to have enough white tops in my wardrobe, they go with everything and always look so fresh. So I'm with you: perfect! I love all of your versions Jane! White one is very classic and it goes with everything. I need something like this! 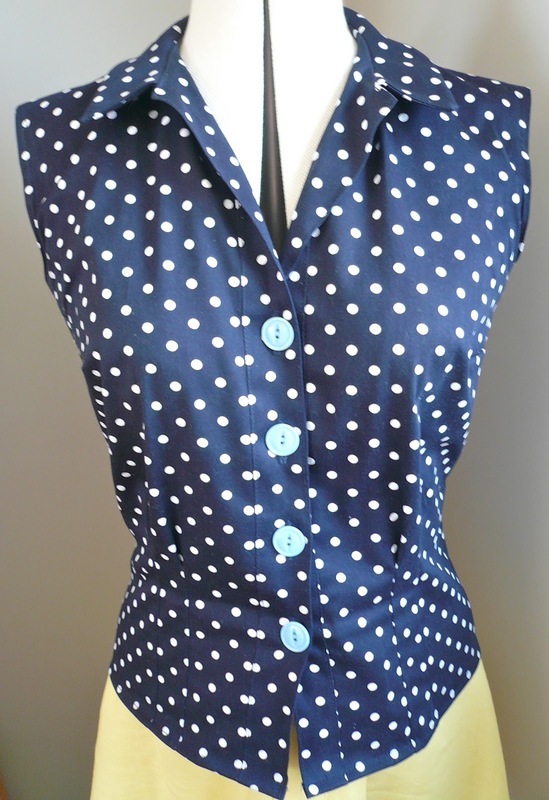 I'm also biased with the navy polka dots! I need this in my wardrobe! Lovely lovely lovely! I bet you will get SO much wear out of this this summer. I've wanted to try out a pique for ages, might have to check out Classic Textiles next time I'm there! If it works, don't fix it! Who except the nitpickers among us would even notice if you wear a garment made in the same style but different fabrics? And who would be mean enough to criticize you for that? The style suits you, you've used fabrics that make you happy. Until my last closet clean-out, I had seven blouses made from the same Burda pattern in regular rotation -- they'd gotten so threadbare that I tossed them out, after scavenging all the buttons. How did I make myself do that? By promising to make seven more, ever so soon as possible. Carry thou on, O Maker of the Vintage 50s Blouse! If it ain't broke don't fix it! This is a lovely blouse and it looks fabulous on you! How fabulous your blouses are! 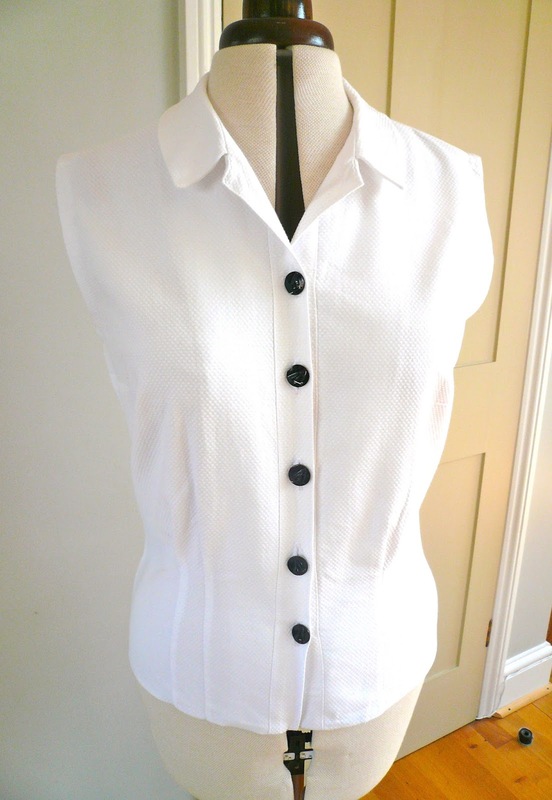 I love fifties blouses, they could never be boring - those dart tucks give them such a lovely shape - semi fitted and shapely but still a touch relaxed. I also love the ones that have slightly kimono sleeves, just like a small cap but cut-on. Or the ones with longer kimono sleeves. I've made a couple and find them perfect for work and play, and they are the only style of blouse i actually like worn outside a skirt (or pants). Love Sewing Magazine - mini giveaway!